Denim lovers know that jean brands vary in shape, sizing and fit. In fact, it can be difficult to buy the perfect pair that fits your waist off the rack. 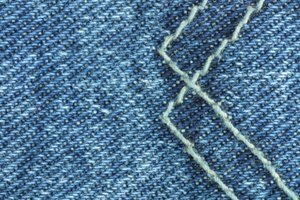 If you have a pair of jeans that are too big in the waist, you can shrink them without sending your denim to the tailor for alterations. For jeans that require shrinking due to rapid weight loss or because of an unflattering fit in the waistline, you can mold your denim to fit your shape without altering the fit of the legs or hips. Fill the teakettle with water. Turn the stove’s burner on medium heat. Put on oven mitts. Once the steam is visible from the mouth of the teapot, remove the kettle from the stove. Place a 15-quart mop bucket or large pot on a sturdy table or kitchen counter. With the oven mitts remaining on your hands, pour the water away from your face into the bucket. Pour slowly to prevent the hot water from touching your skin. Put the waistband of your jeans in the top of the hot water for 10 minutes. Let the legs of the pants hang over the sides of the bucket. Using tongs and a large towel, remove the jeans from the bucket or pot. Roll your jeans in the towel to remove most of the water. Tumble your jeans in the dryer using high heat for 20 to 30 minutes. For jeans with a mixture of spandex or jeans that are preshrunk, you will have to repeat this process two to three times to shrink the jeans in the waist. Your jeans may loosen in the waistband after each wearing. If they do, you may have to repeat this process to shrink the waistband properly.